Panhandle Schutzhund Club is unlike any typical obedience, agility or similar group training clubs or classes where you might expect to pay for the services of a trainer or instructor to teach you. Schutzhund Training consists of three phases (tracking, obedience, and protection) and each phase has various training time to learn and perfect. As a club we try to help facilitate your training by teaching you about the sport and it's various aspect. We support each member throughout the rigorous learning process. It is up to the individual member to be responsible for each phase of the their own training. Panhandle Schutzhund Club is currently open to membership. We currently have no limit on the number of active membership. We welcome anyone who is interested in becoming a member. We allow potential members to visit our club three (3) times so that you may be able to participate in training sessions to ensure that our goals and training methods are what you are looking for. We are open for any new potential member to talk and ask any questions they might have about the sport and also about our club. If after three visits, we will be happy to discuss the membership process and to provide the club by laws, training rules, and membership requirements. To train dogs for the sport of Schutzhund. Support movements that demonstrate the advantages of Schutzhund training. Support and organize trials for Schutzhund. police and search and rescue training. support responsible dog ownership and breeding practices. Schutzhund is a German word meaning “protection dog.” It refers to a sport that focuses on developing and evaluating those traits in dogs that make them more useful and happier companions to their owners. Schutzhund work concentrates on three parts. Many are familiar with the obedience work of the American Kennel Club’s affiliates and will recognize the first two parts, tracking and obedience. The Schutzhund standards for the third part, protection work, are similar to those for dogs in police work. While dogs of other breeds are also actively involved in the sport of Schutzhund and often follow similar criteria for breeding purposes, this breed evaluation test was developed specifically for the German Shepherd Dog. Schutzhund is intended to demonstrate the dog’s intelligence and utility. As a working trial, Schutzhund measures the dog’s mental stability, endurance, structural efficiencies, ability to scent, willingness to work, courage, and trainability. This working dog sport offers an opportunity for dog owners to train their dog and compete with each other for recognition of both the handler’s ability to train and the dog’s ability to perform as required. It is a sport enjoyed by persons of varied professions, who join together in a camaraderie born of their common interest in working with their dogs. Persons of all ages and conditions of life even those with significant disabilities enjoy Schutzhund as a sport. Schutzhund and similar sports/breeding suitability tests are vital for our dog community. Almost all police dogs, drug dogs, accelerant/bomb detection dogs and military dogs, as well as a very high percentage of search dogs, come from Schutzhund breeders and Schutzhund lines. Why? Because it still works as a breeding suitability test, and dogs from these lines are more likely to have the correct temperament and physical structure to do the work, saving thousands of dollars in “wash-outs” from untested lines. Schutzhund and similar training preserves the breeds; Max von Stephanitz developed Schutzhund as a breeding suitability test for the German Shepherd Dog. 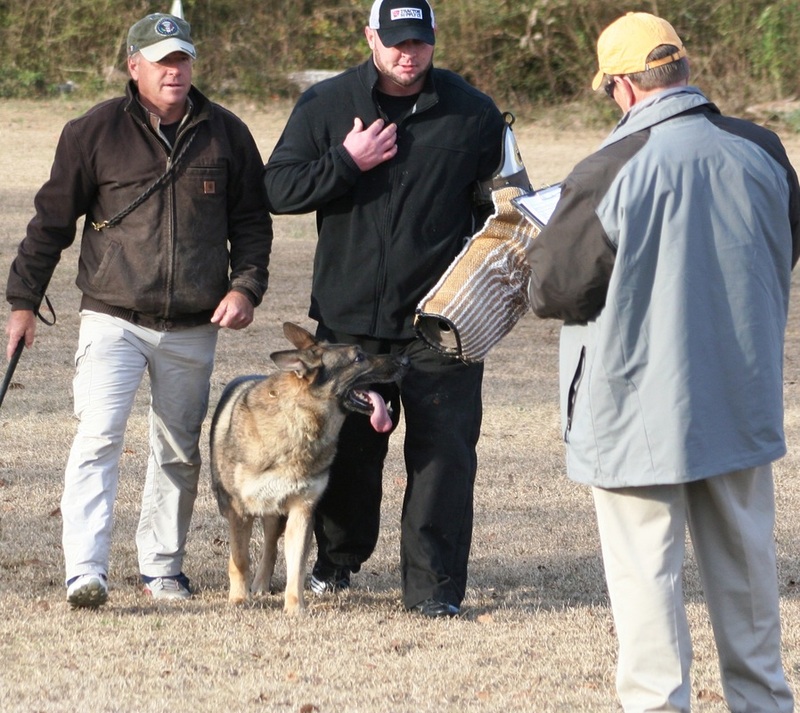 Schutzhund offers excellent training and physical/mental outlet for the dogs. The socialization afforded by a good Schutzhund club is superb, and the Schutzhund dog gets far more physical exercise, mental stimulation, and sheer fun than most pets! The first Schutzhund (now referred to as “IPO”) trial was held in Germany in 1901 to emphasize the correct working temperament and abilities in the German Shepherd Dog breed. Originally, these dogs were herding dogs, but the industrialization of Germany encouraged breeders to promote the use of their dogs as police and military dogs. The Verein fur Deutsche Schaferhunde (SV), the parent club, became concerned that this would lead to careless breeding and undesirable traits such as mental instability, so it developed the Schutzhund test. Since then, many other countries and working dog organizations have also adopted Schutzhund (or IPO) as a sport and a test of working performance in dogs. International rules have been established, and they are administered by the Verein fur Deutsche Hundesport (VDH). The IPO titles are comprised of 3 phases. In each phase, the presiding judge observes and assesses the dog for sound working temperament, as defined in the USCA rules for working dog trials. At all levels, track is laid earlier by a person walking normally on a natural surface such as dirt or grass. For IPO 1 and FRr 1 titles, the track is laid by the handler. For IPO 2 or 3, FPr 2 or 3 and higher level tracking titles, the track is laid by a stranger. The track includes a number of turns and a number of small, man made objects left by this person on the track itself. At the end of a 10 meter leash, the handler follows the dog, which is expected to scent the track and indicate the location of the objects, usually by lying down with it between its front paws. The tracking phase is intended to test the dog’s trainability and ability to scent, as well as its mental and physical endurance. The obedience phase includes a series of heeling exercises, some of which are closely in and around a group of people. During the heeling, there is a gun shot test to assure that the dog does not openly react to such sharp noises. There is also a series of field exercises in which the dog is commanded to sit, lie down, and stand while the handler continues to move. From these various positions, the dog is recalled to the handler. With dumbbells of various weights, the dog is required to retrieve on a flat surface, over a one-meter hurdle, and over a six-foot slanted wall. The dog is also asked to run in a straight direction from its handler on command and lie down on a second command. Finally, each dog is expected to stay in a lying down position away from its handler, despite distractions, at the other end of the obedience field, while another dog completes the above exercises. All of the obedience exercises are tests of the dog’s temperament, structural efficiencies, and, very importantly, its willingness to serve its owner. The protection phase tests the dog’s courage, physical strength, and agility. The handler’s control of the dog is absolutely essential. The exercises include a search of hiding places, finding a hidden person (acting as a decoy), and guarding that decoy while the handler approaches. The dog is expected to pursue the decoy when an escape is attempted and to hold the grip firmly. The decoy is transported to the judge with the handler and dog walking behind and later at the decoy’s right side. When the decoy attempts to attack the handler, the dog is expected to stop the attack with a firm grip and no hesitation. The final test of courage occurs when the decoy is asked to come out of a hiding place by the dog’s handler from the opposite end of the trial field. The dog is sent after the decoy who is threatening the dog with a stick and charging at the handler. All grips during the protection phase are expected to be firmly placed on the padded sleeve and stopped on command and/or when the decoy discontinues the fight. The protection tests are intended to assure that the dog possesses the proper temperament for breeding. The BH or companion dog title is a pre-requirement for IPO titles. All breeds and sizes are eligible with the minimum age requirements of 15 months. In addition to the IPO titles listed above, the United Schutzhund Clubs of America offers several other training degrees: the STPr, FH 1, FH 2, and IPO-FH tracking degrees; the AD which is an 12.5 mile endurance test (one of the requirements for the Breed Survey); separate obedience, protection and tracking titles that reflect the routines for IPO 1, 2, & 3 levels; and RH titles. For IPO 1 the dog must be at least 18 months old and pass an initial temperament test by the judge. In tracking, it must be able to follow a track laid by its handler at least 20 minutes earlier. In obedience, the dog must heel off leash, demonstrate the walking sit, the walking down, and the long down under distraction, as well as the send-out. It must retrieve on the flat and over a hurdle, and over the scaling wall. In the protection phase, the dog must search 2 blinds, perform escape and courage test exercises, and demonstrate a side transport. For IPO 2 the dog must be at least 19 months old and must already have earned its IPO 1 degree. In tracking, the IPO 2 candidate must be able to follow a track laid by a stranger at least 30 minutes earlier. It must again pass all of the obedience and protection tests required for the IPO 1 degree, but those tests, for IPO 2, are made more difficult and require greater endurance, agility, and, above all, control. There is an additional walking stand exercise required in obedience. In protection, the dog must search 4 blinds and demonstrate a back transport of the decoy in addition to the IPO exercises. For IPO 3, the dog must be at least 20 months old and must have earned both the IPO 1 and the IPO 2 titles. Again, the tests now are made far more difficult. The track has four turns, compared with two turns for IPO 1 and 2, and there are three objects, rather than two, that must be found by the dog. The track must be laid by a stranger and be at least 60 minutes old. All exercises in obedience and protection are demonstrated off leash. The walking stand is replaced by the running stand. The picture of obedience, strength, eagerness, and confidence presented by an excellent IPO 3 team is a beautiful illustration of the partnership of human and dog. American Schutzhund began in 1957, when a small group of GSD fanciers in the Santa Clara Valley in California began to meet and train their dogs under the leadership of German immigrant Gernot Riedel. In 1958, this group became the first U.S. Schutzhund Club: the Peninsula Police Canine Corp (PPCC, known today as just Peninsula Canine Corp, or PCC). PPCC held the very first Schutzhund trial on American soil in 1963; at the time, this trial did not include the tracking phase, as the training and participation was influenced heavily by police and law enforcement. The first official SV-sanctioned Schutzhund trial (with all three phases) took place in Los Angeles in 1969, under the direction of Dr. Henry Friehs. At this point in time, the first overarching Schutzhund organization in the U.S. – the North American Schutzhund Association, or NASA – was founded. Trials were held under the auspices of NASA until 1972, at which point the SV (Schaeferhunde Verein, or the parent GSD breed club in Germany) required trials to be held under the German Shepherd Dog Club of America (GSDCA), the official breed club for the GSD in America. The GSDCA’s sponsorship and support for Schutzhund was short-lived, however; by 1975, the GSDCA had declared a moratorium on all Schutzhund trials, as the American Kennel Club (AKC) did not wish to be involved with this sport. Unlike the countries of Western Europe, the United States did not have a long and accepted tradition of working dogs. Most breeders at the time bred for the conformation ring, and emphasized beauty and side gait instead of character and trainability. Thus, this concept of a working trial that served as a breedworthiness test was met with suspicion. This was the impetus for the development of the United Schutzhund Clubs of America. On November 21, 1975, a fledgling USCA (initially known as USA) officially formed and began its journey to become the premier Schutzhund organization in the United States. At its inception, USCA consisted of only six full member clubs and seven affiliated clubs (by 2013, this number had increased to over 200 full member clubs!). By 1977, the newly formed USCA held its very first National Championship, a prerequisite to sending a team from the U.S. to compete at the international level. It was hosted by the Greater Dallas Working Dog Club in Dallas, TX, and was open to all breeds at this point. The judge was SV Judge Ludwig Ernst from Germany. This was the year USCA also sent its first team to the International IPO3 German Shepherd Dog Championship, known as “the Worlds”, or the EUSV (European Union of German Shepherd Dog Clubs—soon to be WUSV, or World Union of German Shepherd Dog Clubs). By 1981, USCA added another national event to its roster: the North American Championship, which often included an FH championship (advanced tracking championship) as well. 1990 saw the addition of a national Sieger Show, as well as the addition of the “World Qualifier”, a GSD-only trial that selected for the top dog/handler teams to represent the United States at the WUSV Championship. This “World Qualifier” was the trial that would eventually become the IPO3 National Championship.